With some dazzling opening preparation – Sergey Shipov called 14…Nxc5! the “cherry on the cake baked in Kramnik’s laboratory” – Vladimir achieved an effortless draw as Black against the World Champion, Vishy Anand. Shipov commentated live on the game in Round 2 of the Tata Steel Tournament. Good time of the day to you, dear chess fans and experts. This is Grandmaster Sergey Shipov, glad to welcome you to the second round of the year’s first super-tournament. We’re going to watch the encounter of the most renowned participants, two World Champions – the previous and the current. Judging by my database, Anand and Kramnik have already played 149 games, which means today’s an anniversary! They’re not far short of the record of Karpov and Kasparov (my database has 193 encounters) – less than 50 to go. 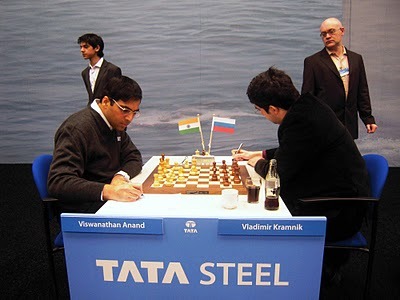 I think Vishy and Vladimir will beat it. And some of us, dear readers, will live to see that day… The titans have made a confident start. Kramnik applied pressure as Black against Nepomniachtchi, while Anand actually managed to win – again, as Black, upsetting Ponomariov. It’s important for the Champions to get their personal encounter out of the way, and then they can play with a sense of their own superiority – against opponents either inferior to them in terms of class, or in authority. Which, in essence, is one and the same thing. 1. d4 Vishy isn’t ready to join the Scotch World Games, while the Scotch has already appeared in Shirov – Carlsen on the neighbouring board. 1…Nf6 2. c4 e6 3. Nc3 Bb4 The Nimzowitsch Defence. 4. Qc2 The Alekhine Variation – currently the most popular. 5. a3 Bxc3+ 6. Qxc3 d5 The height of fashion. This hybrid of the variations with 4…d5 and 4…0-0 is a virtual battlefield for thousands of analyticians and computers. 7. Nf3 One of the three trodden paths. 7…dxc4 8. 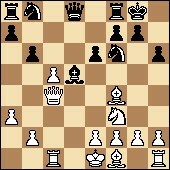 Qxc4 Otherwise Black will hold onto the pawn with b7-b5. This move gives pause for thought. What I said is the honest truth. 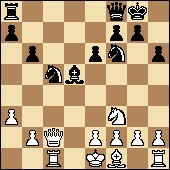 The bishop is more often moved to a6. It seems Vladimir has decided to surprise his opponent. 10. Rc1 A reasonable response. The pressure on the backward c7-pawn is a serious argument. 10…c5 The idea of the Israeli grandmaster Alexander Huzman. It seems it received a high rating in the ex-World Champion’s laboratory. 12. Bf4 It’s pleasant and easy to agree with the titan’s moves. Of course, you wouldn’t want to exchange the powerful bishop. And at the same time you don’t want to hinder the development of the other bishop which is still sleeping, for now. Played quickly and confidently. It’s the computer’s first line by quite some margin. There’s no doubt that Vladimir has accurately checked all the lines with the help of a chess player’s best friends. The move in the game gains an important tempo. 13…Nbd7 It’s become clear that it’s not even just a matter of a tempo. Black has simply brought out the bishop so that it doesn’t come under attack from the c5-pawn. 14…Nxc5! The point! 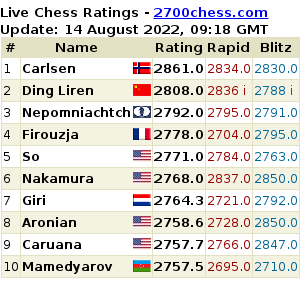 The cherry on the cake baked in Kramnik’s laboratory. 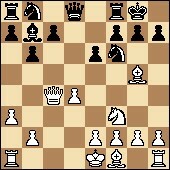 White is up an exchange, but Black has a dangerous initiative. I can already see how this might lead to a repetition of moves. Annoyingly soon! The clocks demonstrate that only one chess player is playing at the board: 1:07 – 1:43. While the other, for now, is suffering. 16. e3 The simplest of flesh-and-blood moves, leading to an unavoidable computer dead-end. 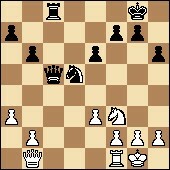 22.Rc3 – will be attacked by the knight i.e. 16…Nb3 The c-file has passed into the complete and undivided possession of Black, while the king hasn’t yet established himself. A dangerous position… Personally I can see salvation, with the help of electronics. But will the unarmed Anand find it at the board? What’s going on with the clocks is even amusing. Kramnik’s time, it seems, is only increasing on account of the added seconds: 0:50 – 1:44! 17. Bc4 It’s hard for our brother to compete with the metal monsters. Vishy desperately wants, finally, to complete his development – which, it seems, gives Black a dangerous initiative… However, I’m exaggerating a bit. White still has solidity in reserve. The game still hasn’t left the bounds of approximate equality. Black will win back the exchange, but analysis shows that White successfully defends. Vladimir has taken an interest in the board for the first time. He’s also become involved! 17…Nxc1 18. Bxd5 Only like that. The clock situation is becoming more respectable: 0:51 – 1:24. White has managed to complete his development – without any sacrifices. A drawn outcome is almost inevitable. The infiltration on c2 isn’t dangerous because of the Nf3-d4 resource. 21…Qc2 Testing out what I said. 22. Qxc2 Just in case his adversary decides to remove the exchange offer.